Just look at this book. It's tea time glamour at its best. A heart shaped cake covered in petals. It did the trick. Let's face it. Predominantly, we buy cookery books for two main reasons. Because they look pretty - either on your bookshelf, or because they have nice pictures. Well, I can confirm that it checks both boxes. This book is all about the show stopper. I'm not talking about cakes with 57 layers bedecked in kilos of delicately moulded sugar paste flowers with something resembling scaffolding on the inside. These cakes are opulent yet classically understated. Think Chanel No. 5. The photographs are shot using fine china, pastel cake stands, beautiful linens and bouquets of flowers as a backdrop. The styling is magnificent. Recipes include favourites such as a moist chocolate celebration cake, carrot cake covered in gold leaf and a section dedicated to beautiful decorations; my favourite being the maypole. I decided to make the Lemony Crunch Cake. Unlike lemon drizzle, this cake had a crunchy sugar topping which set firm. This recipe is going in my permanent file. It was an absolute dream to make, was light as a feather and kept really well. It's certainly one that you could make a couple of days in advance and not have to worry about it going stale. 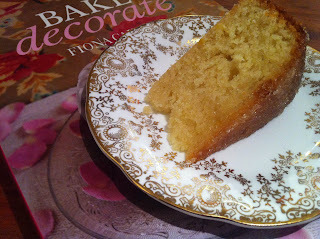 I think I'll be making this cake regularly! This book is a perfect balance, just as the title suggests. For those who are all about the 'bake' there is a wide variety of recipes that are trustworthy and produce impressive results. For those more into their decorating, there are some really pretty ideas that I've not seen in other books. 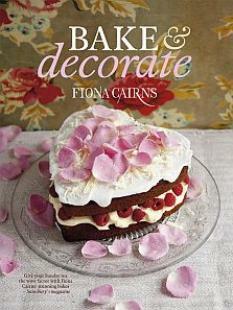 A charming addition to any baker's bookshelf. Disclaimer: I reviewed this book because its pretty cover lured me in like a kid to a candy shop. I received no payment from the publisher for doing so.